It's time for a role playing game adults & kids can both enjoy. Make a character in under 2 minutes. Start playing out of the box. Adventure Maximus! inspires creativity, problem solving and provides quality face time with other human beings rather than staring into computer screens all with the help of dice and cards (by using dice and cards it gives the kids that extra toy value to keep them at the table). Adventure MAXIMUS! 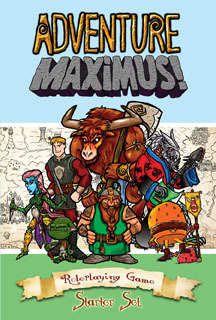 is a card based, introductory Role Playing Game for players 8 years-of-age and up. Players can take on roles from eight different races. Working together as a famous "Adventure Company" based in the fantastic, post-apocalyptic world of Ex-Machina where they can become heroes of legend. When there is trouble, or innocent people need protection from the fierce creatures that populate Ex-Machina, they call on Adventure Companies to save the day!